Alive and Young: Does Facebook Have a Religious Bias? Last week, Father Chris Decker of the Diocese of Baton Rouge in Louisiana, and one of the personalities on the podcast the catholic underground (CU), logged onto his Facebook account only to discover that his religious title “Fr.” had been removed. Quite confused by the matter, and thinking it to be a glich, Fr. Chris called his friend, and other CU personality, Josh Leblanc to inquire about the situation. 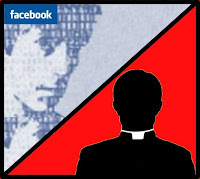 They discovered that the title ‘Father’ had been removed from nearly all the priests on the Facebook network. His suspicions were confirmed; it was no glich. Father Chris and the rest of CU crew, all of whom use various media as tools for evangelization, thought it imperative that the title of “Fr.” remain on priests’ accounts as it demonstrated, in a subtle way, the church and her people encountering and engaging the modern world as well as it actualized the call for the new evangelization. So the CU crew, along with the help of many associates, set out to inquire why the titles of “Fr.”, and in fact “Sr.” also, disappeared from people’s Facebook accounts without any notice or explanation. Father Jason Vidrene, associate pastor at the Catholic church on the University of Louisiana-Lafayette and also occasional guest on the CU podcast who also believes that “Fr.” is not just a mere title but a part of who he is as an ordained Roman Catholic priest, contacted the Facebook staff via email only to receive a reply from a Facebook representative named Patrick who wrote in his reply to Father Jason: “We no longer allow titles on Facebook for sake of confirming a true identity of those who have profiles.” It was an answer that was unsatisfactory. To prove the point that Facebook has no means in confirming its users, does not keeps track of its members’ identity claims, and is not serious about quality control, Josh Leblanc of the CU, created a false account for the late fifth century pontiff Pope Zosimus II. Josh even outfitted Pope Zosimus’ profile with nonexistent universities and other unverifiable information about the late pontiff. According to the late Pontiff’s Facebook profile his activities include “Running the Catholic Church, Appointing Bishops, Writing Encyclicals.” Pope Zosimus job discription goes as follows: “I ran the Catholic Church for a few years.” His favorite TV shows: “TV??? ?” Likewise with movies. Other late individuals who have accounts on Facebook include Flannery O’Connor, Mr. Rogers, and Walker Percy; Yogi Bear even has his own account. To date, Facebook has not given an adequate answer as to why only certain religious, specifically Catholic, titles have been removed, while other professional, political, and titles of other faith traditions remain.